The Kiowa County Board of Commissioners has been honored with the Colorado Parks and Wildlife Southeast Region Partners in the Outdoors Award for 2018. 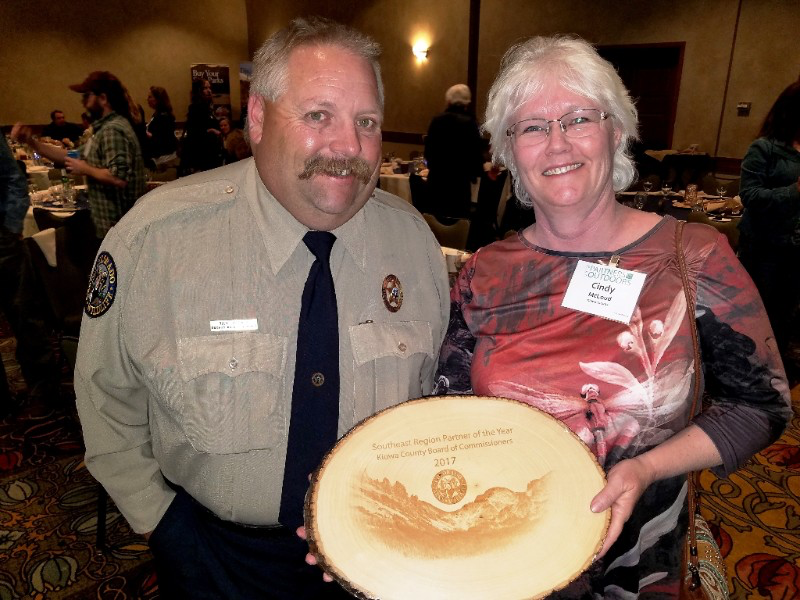 The award was announced at the annual Partners in the Outdoors conference last week in Breckenridge. The Kiowa County Board of Commissioners was nominated by CPW's Rick Gardner, who serves as a district wildlife manager in the Lamar area. Accepting the award on behalf of the county was Commissioner Cindy McLoud. The Kiowa County Commissioners - Richard Scott, Donald Oswald and McLoud - were praised for working with CPW's Area 12 staff to rebuild facilities at the Great Plains reservoirs of Nee Noshee, Nee Gronda and Queens after abundant snowpack and a wet spring brought water levels back in 2017 following years of drought. "The commissioners asked what was needed at the lakes to get them ready for use," Gardner said. "They hired a contractor to clean the toilets and collect trash, splitting the cost with CPW." Facilities at the lakes had deteriorated during the dry years. One boat ramp and beach was overgrown with tamarisk. Dead trees were a hazard at others. A new ramp was needed. The list of projects was discussed at a meeting and site visit. "The commission did not hesitate," Gardner said. "Before we knew it, the Kiowa County Road and Bridge Department was busy removing and stockpiling material and working with the CPW staff to remove the tamarisk and complete the ramp repairs. Then hazard trees were knocked down and piled. "In early January 2018, we discussed constructing a second boat ramp. Once a plan was made, the Kiowa County Road and Bridge team constructed the second boat ramp." Kiowa County even helped CPW with projects in other counties, in particular supplying equipment to assist with a boat ramp in Bent County. "The cooperation CPW Area 12 has received from Kiowa County Commissioners has been great," Gardner said. "None of these projects would be anywhere near where they are today if the commission had not embraced them and provided the equipment and personnel needed."